With this post to our Local History Room weblog, we continue our series on a pair of sensational deaths that occurred in Pekin, Illinois, during the Prohibition Era. The Local History Room columns in this series, entitled “The Third Degree,” originally ran in the Saturday Pekin Daily Times from Sept. 15, 2012, to March 2, 2013. On Thursday, March 2, 1932, the defense rested its case in the manslaughter trial of Tazewell County Sheriff’s Deputies Charles Skinner and Ernest Fleming, who were accused of the death of jail inmate Martin Virant. As the defense lawyers concluded the efforts to exonerate Fleming and Skinner, they delivered a compelling attack on the credibility of the state’s star witness Elizabeth Spearman, whose testimony implicated Skinner and Fleming in the severe injuries Virant had suffered. In the end, the defense attorneys moved to have the whole of Spearman’s testimony quashed and stricken from the record. Though Spearman, as an accused criminal and jail inmate, probably had just as great a problem with her credibility and accuracy as most of the defense’s jail inmate witnesses, nevertheless, Menard County Judge Guy Williams granted the defense’s motion. In closing arguments lasting the entire morning of March 3 – arguments the Pekin Daily Times described as a “powerful oration” – defense attorney Jesse Black, reveling once more in the courtroom drama at which he excelled, denounced and ridiculed the state’s case. “At times the attorney could be heard a block away as he shouted his denunciation of an attempt to deprive men of their liberty and ‘put them behind grey walls’ without any proof whatsoever,” the Daily Times reported. In contrast, Tazewell County State’s Attorney Nathan T. Elliff delivered his closing arguments in a calm and quiet demeanor. “As to doubts about this case, I have just two doubts in my mind. One of these is whether this is a murder or a manslaughter. The other doubt in my mind is whether or not we’ve got all the defendants that are guilty,” Elliff said. After closing arguments, Judge Williams gave instructions to the jury, reminding them to disregard Spearman’s testimony. The case went to the jury at 3:30 p.m. on March 3. The jurors came back with a verdict at 2:20 p.m. Saturday, March 4, 1933. “JAIL DEATH JURY SAYS ‘NOT GUILTY,’” ran the Pekin Daily Times headline that day. Both deputies were found not guilty of all charges. It was a stunning victory for Black and his fellow attorney William J. Reardon (though Reardon was called away from the trial at the very end due to the death of his brother in St. Louis on the night of March 2). Their decades of courtroom experience obviously had served them well. And it was an embarrassing defeat for Elliff, whose youth and inexperience were frequently evident during the course of the trial. “In Attorneys Reardon and Black, the defense has a pair of crafty barristers of long experience in court cunning. They know when to object and when to be silent,” wrote Pekin Daily Times reporter Mildred Beardsley in the Monday, Feb. 27, 1933 edition of the newspaper. In the final analysis, however, perhaps neither the inexperience of the prosecutors, nor the talent of the defense attorneys, nor the valiant attempts of the defense to explain away the convincing forensic evidence that Virant had been beaten and had not died of hanging, were that important in the exoneration of Fleming and Skinner. The greatest challenge the prosecutors faced wasn’t proving that Virant had been beaten while in custody at the jail, nor that he had already died prior to being hanged – it was proving that Fleming and Skinner were connected to the crime. Without Virant’s own testimony at the inquest of Lew Nelan, and without Spearman’s testimony, the jury had no evidence that Fleming and Skinner, or any other deputy, had done violence to Virant or faked his suicide. Proving that Virant was the victim of a crime was one thing. Proving that the crime had been committed by Fleming and Skinner was something else altogether. And so the trial was over. Fleming and Skinner were free men. Nevertheless, the tragedy of Virant’s death was nowhere near its final act. Next week: Petitions for impeachment. 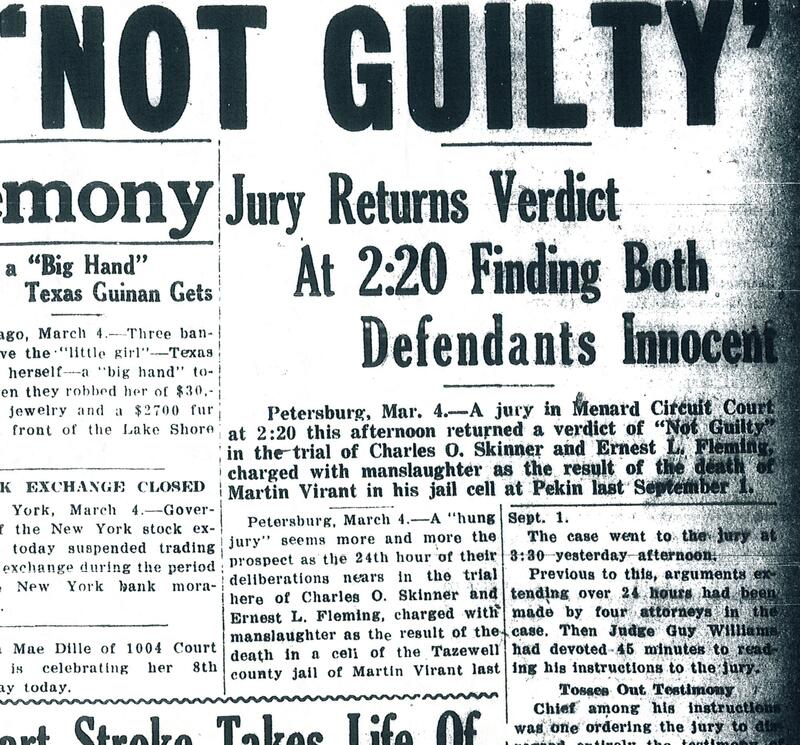 The front page of the March 4, 1933 Pekin Daily Times carried the banner headline, “JAIL DEATH JURY SAYS ‘NOT GUILTY’.” Thus concluded the trial of the county deputies accused of the “third degree” torture death of Martin Virant. But the tragedy of Virant’s death was nowhere near its final act. During the two weeks of the manslaughter trial of Tazewell County Sheriff’s deputies Ernest Fleming and Charles Skinner in late February and early March 1933, the prosecution and the defense presented the jury with their explanations of how Tazewell County jail inmate Martin Virant had ended up dead and hanging in his cell on Sept. 1, 1932. The state contended that because Virant denied any involvement in the murder of Lewis Nelan, the deputies administered a so-called “third degree” interrogation of Virant, beating and torturing him to extract useful information or a confession. The prosecutors said Virant succumbed to his injuries, and the deputies, finding Virant dead, arranged the death scene to make it appear that he had committed suicide by hanging. But the defense insinuated that Virant had in fact participated in Nelan’s murder, and, overcome by guilt, he hanged himself in his cell. One of the witnesses for the defense, jail inmate Joe Hensley, even claimed to have heard Virant say, “Poor John, he did I did too.” Those words, according to the defense, amounted to a confession that he had helped John Petje murder Nelan. To establish their alternate scenario, the defense had to explain the compelling evidence that Virant had been horrifically beaten and that he had already died prior to being hanged. To overcome that evidence, the defense called three medical experts, who cast doubt upon the death investigation and the findings of the state’s experts. The defense’s experts offered no explanation for the testimony of former Tazewell County Coroner Dr. Arthur E. Allen, who said Virant’s body showed none of the usual signs of a hanging death. To deal with Dr. Allen’s testimony, the defense attorneys endeavored to impeach his credibility by insinuating that Allen was involved in a personal political vendetta against Fleming and Skinner. Allen, a Republican, had recently lost his re-election bid to the Democrat’s candidate Dr. Nelson A. Wright Jr., and Fleming and Skinner had quietly encouraged people to vote for Wright. Fleming and Skinner, both Democrats, also had campaigned against Allen four years earlier. During cross-examination of Allen, defense attorney Jesse Black Jr. suggested that Allen harbored resentment against Fleming and Skinner. In effect, Black insinuated that Allen had framed Fleming and Skinner, with the implication that Allen had lied about Virant’s body not showing the usual signs of a hanging death, and also had lied about easing Virant’s body to the floor when he had really, so Black and several defense witnesses claimed, allowed the body to crash to the floor. Also called to testify at the trial was former Tazewell County State’s Attorney Louis P. Dunkelberg, who according to the defense’s scenario would have been Allen’s co-conspirator in the framing of Fleming and Skinner. The four deputies who testified for the defense claimed Dunkelberg had seen Virant briefly during part of the time he was interrogated by the deputies. However, when the state called Dunkelberg to the stand and asked him to describe Virant’s appearance, the defense objected and Judge Williams upheld their objection, so Dunkelberg was not allowed to say if Virant had any injuries on him when he saw him. Notably, one person central to the drama of Virant’s death was never called as a witness in this trial: Tazewell County Sheriff James J. Crosby. Neither the prosecution nor the defense summoned him to testify, because Crosby was still convalescing from the severe heart attack he’d suffered on Nov. 5, 1932. 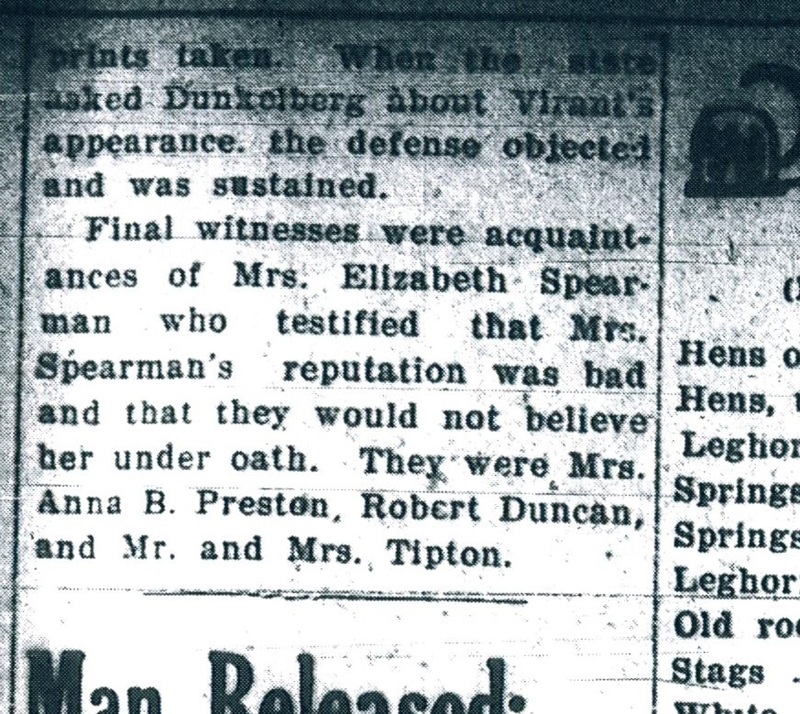 As indicated in this excerpt from a March 2, 1933 Pekin Daily Times report, the credibility of the prosecution’s key witness Elizabeth Spearman of Peoria was thrown into doubt by the defense in the manslaughter trial of Tazewell County Sheriff’s deputies Ernest Fleming and Charles Skinner, who were accused of causing the death of Tazewell County Jail inmate Martin Virant. To put the finishing touches on its case, the defense called a series of character witnesses, who testified that Deputies Fleming and Skinner were men of character and virtue who would be very unlikely to commit acts of violence. The defense also called another series of character witnesses to undermine the credibility of jail inmate Elizabeth Spearman, whose testimony for the prosecution had strongly implied that Fleming and Skinner had beaten Virant. The testimony of these character witnesses was very helpful to the defense – and the defense lawyers also made a great deal of Spearman’s error that Fleming and Skinner, rather than Skinner and Hardy Garber, had taken Virant to the Nelan inquest. The defense’s attack on Spearman was so effective that in the end, when the defense rested on Thursday, March 2, 1933, the defense attorneys made a motion to have the whole of Spearman’s testimony quashed and stricken from the record. At the end of a long succession of witnesses and physical evidence, the prosecution rested its case on Feb. 26, 1933, in the trial of Tazewell County Sheriff’s deputies Ernest Fleming and Charles Skinner, who were accused of causing the death of Tazewell County Jail inmate Martin Virant by severely beating him during a so-called “third degree” interrogation. The following day, the defense attorneys Jesse Black Jr. and William J. Reardon began to call their own lengthy list of witnesses and experts, who would help the defense build its case that the deputies never did any violence to Virant, nor did they hang his dead body – rather, the defense contended, Virant had committed suicide. Heading the witness list was J. Hardy Garber, a deputy who helped Skinner bring Virant to and from the Lew Nelan murder inquest. Garber and the three other deputies involved in this case – Fleming and Skinner, who both took the stand in their own defense, and Frank Lee, originally indicted by the Tazewell County grand jury but whose charges were dropped just before the trial began in Menard County – offered very important testimony. Presenting a united front, they resolutely denied that anyone had done more than raise his voice at Virant while he was in the custody of the Tazewell County Sheriff’s Department. The four deputies agreed that there had been absolutely no beating or kicking or any kind of rough handling. The four deputies did state, however, that they noticed Virant had some cuts and bruises about his head and neck when he was first brought to the jail. They denied knowing how Virant had gotten those injuries. The deputies also agreed that Virant became very frightened and upset, and refused to let them take his fingerprints, after Lee brought in a package containing two metal pipes and unrolled it in Virant’s presence. Skinner and Fleming also supplied a very important element of the defense’s alternate scenario of Virant’s injuries and death. Flatly contradicting former Coroner A. E. Allen’s testimony that he had eased Virant’s body to the cell floor when he cut his body down, Skinner and Fleming claimed Allen had irresponsibly and unprofessionally let Virant’s body crash to the floor. Virant’s body had even slammed against the toilet as it fell, the accused deputies insisted. Relying on their medical experts, the defense argued that most of Virant’s bruises and injuries, including his broken rib, were caused when Allen cut his body down and let it crash to the floor. Also backing up this claim were three jail inmates, Charles Cameron, 62, formerly of Delavan, Joe Hensley, and Thomas Davis. Cameron, a jail trustee, told the jurors, “I saw Allen cut the strap and saw Virant fall on the toilet bowl. He came down awful hard . . . He was dropped. Mr. Allen didn’t touch him. . . . It jarred the whole floor of the cell.” Cameron even claimed that Allen jumped out of the way so Virant’s body would hit the toilet as it fell. In cross-examination, however, Elliff showed that Cameron’s testimony differed significantly from what he had previously told the Tazewell County grand jury and disagreed with a statement he had made to former Tazewell County State’s Attorney Louis P. Dunkelberg on Sept. 9, 1932. Cameron responded to Elliff’s questions by disavowing most of his prior statement, and in particular he denied speaking to fellow inmate Elizabeth Spearman. Cameron’s original statements had corroborated key elements of Spearman’s testimony, which supported the state’s case that Fleming and Skinner had beaten Virant. The words Hensley claimed to have heard Virant say, according to the defense, amounted to a confession that he had helped John Petje murder Lew Nelan. A sense of guilt over his role in Nelan’s death was the reason he committed suicide, the defense attorneys claimed. Davis also testified that he heard noises from Virant’s cell three times that night as of someone jumping off the bunk, including at 2 a.m. and 3 a.m. In addition, Davis claimed to have heard the same kind of noise sometime after 1 p.m. on Thursday, Sept. 1, and to have heard Virant making a noise. The defense argued that the noises Hensley and Davis said they heard Tuesday night were not the groans of a man who had been severely beaten, but were the sounds of Virant attempting to hang himself using some strings and threads that investigators found in his cell after his death. The defense attorneys suggested that some of Virant’s injuries may have been caused during this purported first suicide attempt, but they did not try to explain why Virant would have opted first for strings that were unlikely to support his own weight and only two days later decide to use his own belt. The defense also claimed that Davis had heard the sounds of Virant killing himself on Thursday, Sept. 1. Or were they the sounds of deputies faking Virant’s suicide? Next week: The defense rests. In the sensational case of the “third degree” death of Tazewell County Jail inmate Martin Virant, prosecutors contended that Virant succumbed to severe injuries he’d suffered at the hands of Sheriff’s deputies, who then staged a hanging even though he obviously had died before his body was hanged. 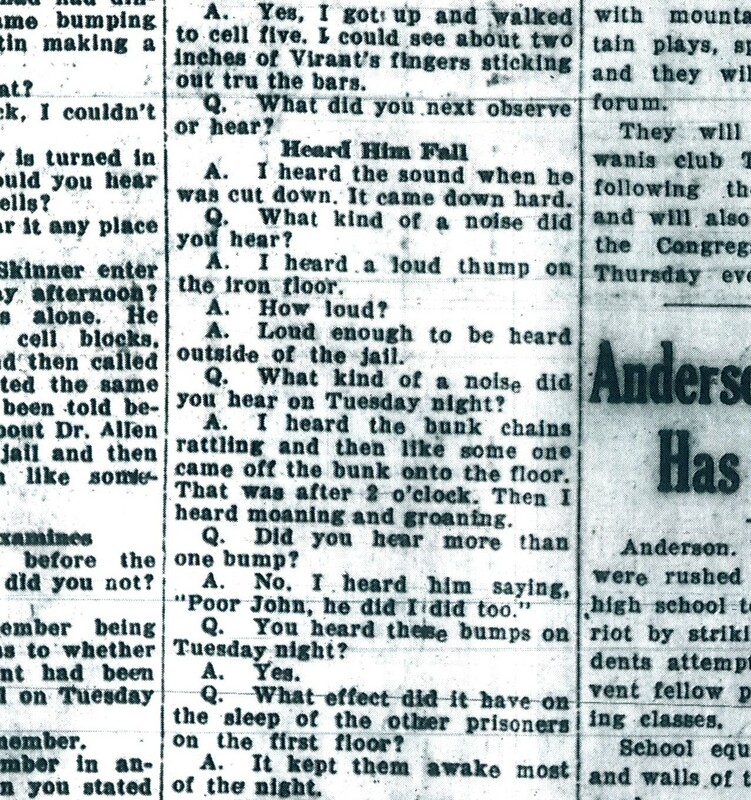 But defense attorneys, relying on testimony such as that found in this detail from a March 1, 1933 Pekin Daily Times report, countered by insinuating that Virant helped John Petje murder Lew Nelan and then, wracked by guilt, hanged himself in his jail cell. The defense argued that Virant’s severe injuries were inflicted by Tazewell County Coroner Arthur E. Allen, whom the defense claimed was incompetent and careless. Three days into the manslaughter trial of Tazewell County Sheriff’s Deputies Ernest Fleming and Charles Skinner, who were accused of causing the Sept. 1, 1932 death of jail inmate Martin Virant, prosecutors had made great progress in laying out their case. Ample witness testimony had established that Virant was uninjured when he first came to the jail on Aug. 30, but somehow had acquired several noticeable injuries about the head and neck by the time he was brought to the Lew Nelan murder inquest on Aug. 31. Testimony from jail inmate Elizabeth Spearman of Peoria also strongly suggested that Virant’s injuries had been caused by Skinner and Fleming. In response, during cross examination the deputies’ attorneys, Jesse Black Jr. and William J. Reardon, diligently attempted to discredit or throw doubt upon the testimony of the state’s witnesses. Black and Reardon were both retired Tazewell County judges, and their great legal skill and extensive courtroom experience were prominently displayed during this trial. Black’s style and personality often broke up the trial’s tedium and monotony, though it wasn’t always clear whether his approach was helping or harming the defense. At times Black’s enthusiasm could get the better of him, and Judge Guy Williams would have to admonish him for being too aggressive or too hostile in his cross examination. Black also reveled in the use of his own body, or the body of co-attorney Reardon, as if they were exhibits for the defense. One of those times came on Feb. 23, 1933, during Black’s cross examination of Edward Jackson, embalmer at Kuecks Funeral Home, who was present at the Lew Nelan inquest and saw that Virant was hurt. Also, after Virant died, Jackson took his body from the jail to back to Kuecks. Jackson saw that Virant had two black eyes, the right ear was black, the neck was black, and he had about six large bruises in the middle of his back and on the shoulder blade. As he questioned Jackson, Black asked him to explain how he embalmed Virant’s body. Black took off his jacket so Jackson could “demonstrate” embalming on his own body, but the demonstration didn’t get very far before Judge Williams upheld the state’s objection that Black’s line of questioning was irrelevant. Probably the liveliest – and no doubt the most (unintentionally) humorous – moment of the trial came on Feb. 24, during Black’s cross examination of former Tazewell County Coroner Dr. Arthur E. Allen. An absolutely crucial element of the defense’s strategy was to cast as much doubt as possible upon the findings of investigators that Virant was already dead prior to being hanged, and to try to undermine the credibility of the prosecution’s expert witnesses. Black had already attacked Allen’s honesty and impartiality in the press, so there probably was no love lost between the two men as they faced off against each other during an occasionally testy or even heated cross examination at the Menard County Courthouse. An unintentionally humorous episode in the Martin Virant jail hanging trial was featured on the front page of the Pekin Daily Times on Feb. 24, 1933. 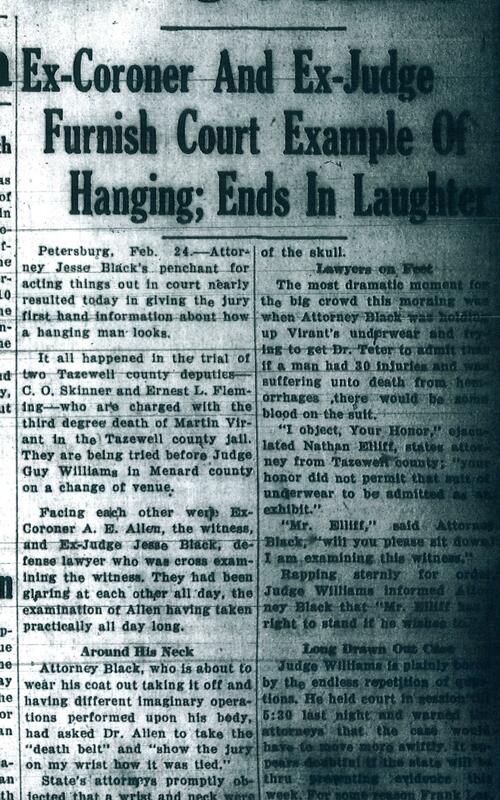 Daily Times staff writer Mildred Beardsley reported, “Attorney Jesse Black’s penchant for acting things out in court nearly resulted today in giving the jury first hand information about how a hanging man looks . . .
“Facing each other were Ex-Coroner A. E. Allen, the witness, and Ex-Judge Jesse Black, defense lawyer who was cross examining the witness. They had been glaring at each other all day, the examination of Allen having taken practically all day long. “State’s attorneys promptly objected that a wrist and neck were far different and Judge Williams ruled that if Black wanted the demonstration it would have to be on his neck. “Dr. Allen was only too glad to put a strap about Black’s neck and did so. “‘Tighten it up a little,’ said Black, or words to that effect. “A few moments more and the jury could have seen first hand the blackened face, the protruding tongue, and the frothing mouth of a hanged man – which is the whole point in dispute in this trial. Next week: Clash of the medical experts. On Feb. 21, 1933, the first day of the Martin Virant manslaughter trial in Petersburg, Ill., prosecutors began to build their case that Virant, an inmate at the Tazewell County Jail in Pekin, had been brutally beaten by Sheriff’s Deputies Ernest L. Fleming and Charles O. Skinner. Virant, a potential witness in the Lew Nelan murder case, was found hanging in his cell on Sept. 1, 1932, but investigators and a coroner’s inquest jury found that he was already dead when he was hanged, and that the hanging had been staged to try to cover up the true cause of death. Many of the same people who testified at the Virant inquest on Sept. 14, 1932, also testified during the manslaughter trial. For example, the first witness for the prosecution was Frank Franko of Peoria, Virant’s brother-in-law, who repeated for the jury what he had previously testified at the inquest. Next, the jurors heard testimony from Tazewell County Jail inmate Elizabeth Spearman of Peoria, who provided crucial testimony on behalf of the prosecution regarding Virant’s treatment and statements he made, as well as the injuries he suffered while in the custody of the county’s deputies. Spearman’s testimony was vital to the state’s case, because, on account of Virant being dead, Judge Guy Williams had excluded as inadmissible hearsay the entirety of Virant’s testimony at the Lew Nelan inquest, when a noticeably injured Virant boldly accused Skinner and other deputies of nearly beating him to death. After Spearman’s testimony, the state called Peoria attorney Vic Michael, legal counsel for the Virant family who was representing them in a wrongful death lawsuit against Tazewell County Sheriff James J. Crosby. On Sept. 1, Michael had accompanied Virant’s sister and Frank Franko to Pekin to get Virant released from jail. 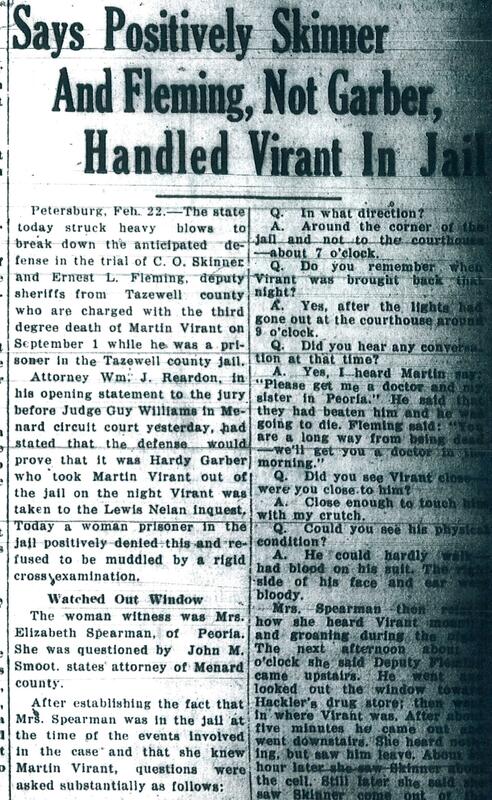 Like Michael, several other witnesses provided testimony establishing that Virant had no visible injuries when he was first brought to the jail on Aug. 30, 1932, and describing Virant’s injuries that they saw at the Nelan inquest or on his dead body. Among those witnesses was Pekin attorney James St. Cerny, who was called to the stand after Michael and who testified that Virant had no visible injuries when he was booked into the jail. Similarly, in testimony on the second day of the trial, Feb. 22, 1933, Edward Tucker, East Peoria city clerk, George Reichelderfer, superintendent of East Peoria water works, and Charles Schmidt, East Peoria justice of the peace, all said that Virant had no visible injuries when they saw him with Deputy Skinner in East Peoria on Aug. 30. Frank Virant, however, saw his brother’s body at the undertakers on the day of his death, and noticed “a black spot on his left ear that extended down to his jaw,” which obviously could not have resulted from a hanging. The next to testify was George Genseal, who, like Virant, had been brought to the jail as a suspect in the Nelan murder case, but subsequently was released. He reiterated what he had said at Virant’s inquest, substantiating key points of Spearman’s testimony. After Genseal, Edward Hufeld, one of the defendants in the Nelan case, was called to the stand. The detail from a page of the Feb. 22, 1933 edition of the Pekin Daily Times shows a portion of the testimony of Edward Hufeld, who was called as a prosecution witness in the manslaughter trial of two Tazewell County Sheriff’s deputies accused of beating and torturing jail inmate Martin Virant to death. If Hufeld was remembering truthfully and accurately, this comment would suggest that even before he had ascended the stairs to the upper tier of cells, Skinner already knew he would find Virant dead and hanging. On the third day of the trial, Feb. 23, the state called H. A. McCance, jury foreman at the Nelan inquest, and asked him to describe Virant’s appearance and demeanor during the inquest. Though Virant’s testimony at the inquest was inadmissible, McCane still was able to tell the jury that Virant appeared to be in pain or distress, and that his face appeared to be in misery. As the trial continued, the state made its way down its lengthy list of witnesses, methodically and painstakingly – and at times tediously – laying out its case for the deputies’ guilt. But thanks to defense attorney Jesse Black Jr. of Pekin, the trial proceedings never stayed boring for very long. Next week: The courtroom theatrics of Attorney Black. With a jury of 12 men selected and sworn in, the manslaughter trial of Tazewell County Sheriff’s Deputies Ernest L. Fleming and Charles O. Skinner immediately got under way on Tuesday, Feb. 21, 1933, at the Menard County Courthouse in Petersburg, Ill. The two deputies were accused of causing the death of Tazewell County Jail inmate Martin Virant of East Peoria by beating him severely while administering what was in those days euphemistically known as “the third degree” (i.e., the police beating and torture of suspects and witness in order to extract confessions or useful or incriminating information). Before the actual trial began, however, the prosecution was dealt a setback when Judge Guy Williams ruled that Virant’s testimony at the inquest into the murder of Lewis Nelan, when Virant publicly accused Skinner and other deputies of beating him, was inadmissible hearsay. Long-established procedural rules dictated that hearsay, and testimony from dead persons, are usually inadmissible as evidence at trial. Virant’s inquest testimony was explosive, and particularly damning for Skinner, so understandably the state argued that the circumstances and substance of Virant’s inquest testimony constituted an exception to the usual rules and therefore should be admitted. Judge Williams was unconvinced by their arguments, however. His ruling made the task of tying Skinner and Fleming to Virant’s death more difficult, but the state had known that the quashing of Virant’s accusation was a real possibility. Menard County State’s Attorney John M. Smoot and Tazewell County State’s Attorney Nathan T. Elliff would have to try to link Skinner and Fleming to the crime through the testimony of Tazewell County Jail inmates. One of those inmates was Elizabeth Spearman of Peoria, who gave testimony on Wednesday, Feb. 22, that was potentially at least as damning as the Virant inquest testimony that had been disallowed. One of the prosecution’s most important witnesses in the trial of the deputies accused of beating Martin Virant to death was a jail inmate named Elizabeth Spearman, of Peoria, who offered testimony that strongly indicated that the deputies were involved in Virant’s severe “third degree” beating. This detail of the Feb. 22, 1933 Pekin Daily Times front page shows a portion of that day’s report on Spearman’s testimony. Then, according to Spearman, about 7 p.m. Fleming and Skinner again took Virant out of his cell. Spearman said she saw them take Virant around the corner of the jail and not to the courthouse (this was actually on Aug. 31, when Virant was taken to the Lew Nelan inquest, but it was Skinner and Hardy Garber who took Virant to the inquest, not Skinner and Fleming). The deputies brought him back to his cell around 9 p.m., after the courthouse lights had gone out. She also said that at one point Virant was “close enough to touch with my crutch,” and it was obvious that Virant was severely injured. “He could hardly walk – had blood on his suit. The right side of his face and ear were bloody,” she said. According to the Feb. 22, 1933 Pekin Daily Times, “Mrs. Spearman then related how she heard Virant moaning and groaning during the night. The next afternoon about 12 o’clock she said Deputy Fleming came upstairs. He went and looked out the window toward Hackler’s drug store; then went in where Virant was. After about five minutes he came out and went downstairs. She heard nothing, but saw him leave. Fleming then hastened upstairs, coming back down very soon after. Coroner A. E. Allen arrived on the scene shortly after that, Spearman said. Next week: The prosecution painstakingly lays out the case.